including a DCO Symposium on 26 June. View a compilation of the events. DCO is hosting a Symposium at the Pacifico Yokohama Conference Center on Sunday, 26 June 2016 from 9:00 a.m. - 5:30 p.m. 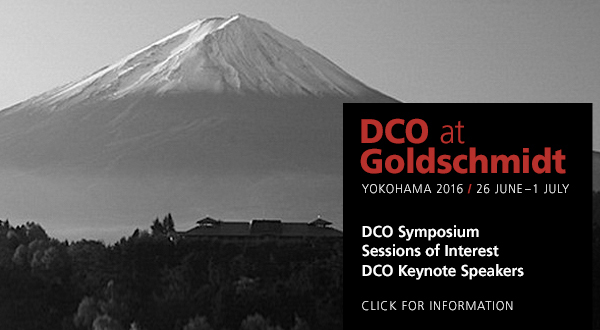 Whether you are local to the Yokohama area or are in town for Goldschmidt 2016, we welcome you to join us at the Symposium for a full day of DCO-related talks. Members of the DCO Executive Committee will provide introductions to DCO's four science communities, followed by a series of invited speakers presenting recent exciting results from the Deep Life, Deep Energy, Reservoirs and Fluxes, and Extreme Physics and Chemistry Communities. Symposium Organizing Committee: Eiji Ohtani (Tohoku University), Fumio Inagaki (JAMSTEC), Kagi Hiroyuki (University of Tokyo), and Yuji Sano (University of Tokyo). The Symposium opens with introductions by the Symposium Organizing Committee and DCO Executive Director Robert Hazen. Mitchell Sogin and Isabelle Daniel will introduce DCO's Deep Life and Deep Energy communities respectively, followed by keynote speaker Ken Takai and invited speakers David Wang and Yohei Suzuki. Marie Edmonds will introduce DCO's Reservoirs and Fluxes community followed by keynote speaker Hiroshi Shinohara and invited speakers Takanori Kagoshima, Takeshi Ohba, and Junichiro Ishibashi. The final session of the day consists of an introduction to the Extreme Physics and Chemistry Community by Craig Manning, and related talks by keynote speaker Toshiaki Iitaka and invited speakers Koichi Mimura and Hiroaki Ohfuji. We will conclude the Symposium with an opportunity for discussion with DCO Executive Committee members and closing comments from DCO Director Craig Schiffries. The Symposium represents a great opportunity to learn more about the latest in deep carbon research and meet other interested scientists from around the world. Registration is required, but free. Please see the Symposium website for more details and/or contact Jennifer Mays (DCO Secretariat) for information. The DCO Engagement Team is seeking feedback on ways we can improve the DCO website. Please take 5 minutes and fill out this short survey by 30 June 2016. Speakers will present recent exciting results from the Deep Life, Deep Energy, Reservoirs and Fluxes, and Extreme Physics and Chemistry Communities. We also take this opportunity to warmly welcome members of the Japanese geochemical, geophysical and geomicrobiological communities to join the DCO Science Network. Attendees do not need to be registered for Goldschmidt 2016 to attend this symposium. The IODP "T-Limit" Project Workshop is a one-day event on 25 June 2016 to be held on the Japanese drilling vessel Chikyu. This workshop will discuss how to achieve important scientific objectives regarding the limits of the deep biosphere during the upcoming IODP Expedition 370. This event includes tours of the cutting edge laboratories, equipment, and facilities aboard the scientific drilling vessel Chikyu, and lectures from leading scientists. The objective of this ICDP-DCO-MLR-IUGS-CGS sponsored workshop is to develop a full proposal to be submitted to ICDP to implement a deep multi-well (1000 - 6000 m) underground laboratory using the large number of existing boreholes in the Songliao Basin, NE China. DCO will hold its second Summer School in Yellowstone National Park from 23-28 July 2016. This Summer School will introduce approximately 35 students and early career researchers to the interdisciplinary concepts, which are the cornerstone of DCO’s approach to understanding Earth. The workshop seeks a broad range of applicants interested in discussing the scientific motivations for an interdisciplinary Earth, ocean, and atmospheric research program focused around the scientific questions and societal hazards related to subduction zones. The Bigelow Laboratory for Ocean Sciences is seeking a qualified and highly motivated individual for a postdoctoral research scientist position in the laboratory of Dr. Beth Orcutt. The research will be related to the study of the marine deep biosphere, focusing on the use of subseafloor observatories to study microbial processes, building off international ocean drilling program field sites on the Juan de Fuca Ridge flank, the Mid-Atlantic Ridge Flank and/or the Atlantis Massif. Highly successful candidates would have experience with environmental science and/or microbiology or biogeochemistry, with working knowledge of molecular biology techniques (such as DNA extraction, amplification, and sequencing or bioinformatics), microscopy, or stable isotope techniques considered as highly desirable. Applicants must have at least a PhD in marine sciences, oceanography, environmental microbiology or similar field with a proven publication record. Experience with project management or fieldwork also desired. Proficiency in computer programs for word processing and data entry are a must, as well as good written and oral communication skills. The position is offered for two years. The position has an expected start date of September 2016, but this may be negotiated. Review of applicants will begin immediately and proceed until the position is filled. The Department of Earth and Planetary Sciences at Johns Hopkins University invites applications for multiple tenure-track or tenured faculty positions. The positions can be filled at the Assistant, Associate, or Full Professor level, starting as early as Fall 2016. The successful candidates are expected to develop internationally recognized and externally funded research programs, to help develop and participate in undergraduate and graduate teaching, and to supervise graduate student research. In the case of an appointment with tenure, the candidate must already be internationally recognized and have a demonstrated record of external research funding. A PhD is required in the Earth Sciences or a related natural sciences discipline; post-doctoral experience is desirable. Applicants are sought for two focus areas: 1. Geosciences including low-temperature geochemistry and studies of the early Earth, cosmochemistry, geophysics and geodynamics, volcanology and igneous petrology. We are particularly interested in candidates whose research has synergies with our recent hires with expertise in sedimentary, metamorphic and tectonic processes, planetary geology, and planetary atmospheres. 2. Environmental Sciences including: natural resources (including water, metals, soils, and energy), ecology, critical zone science, marine sciences, cryospheric sciences, geomorphology, landscape hydrology, environmental change, air pollution, and, biogeochemistry. We are particularly interested in candidates whose research has synergies with our program in Global Environmental Change and Sustainability. The Department of Terrestrial Magnetism (DTM) at the Carnegie Institution for Science seeks applicants for the position of Staff Scientist in the broad categories of geophysics, geochemistry, and/or cosmochemistry. We are particularly interested in innovative researchers whose observations help constrain the role of fluids (e.g., water, other volatiles, melt) in: the past and present evolution of the solid Earth; the formation and early development of Earth’s atmosphere; and/or the origin of volatiles on Earth and other rocky planets. Subfields of interest include, but are not limited to, geodesy, geo/cosmochemistry, magnetotellurics, noble gases, remote sensing, seismology, and/or astrochemistry. Applicants who integrate across traditional boundaries are particularly encouraged to apply. The applicant should complement existing strengths within the Department. We especially encourage applications from early career scientists and from members of traditionally underrepresented groups. Applications should be submitted online here and should include a curriculum vitae, a brief statement of research plans, and abstracts from the applicant’s three most important papers. Please also provide the names, email addresses, and phone numbers of three professional referees, whose letters may be requested by DTM. Review of applications will begin 1 August 2016. 15 June 2016: What Sustains The Earth’s Magnetic Field? 1 June 2016: Just what sustains Earth's magnetic field anyway?